Simply put, Power Pro is the ultimate combination of modern technology and old-fashioned fishing knowledge. 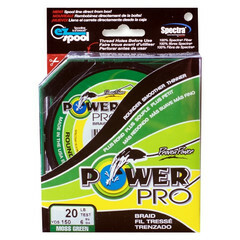 Power Pro provides consistent, trouble-free performance on all reels, from the smallest ultra-lights to the largest bait casters. You'll cast farther and with greater accuracy every time, feel each tiny twitch of your lure, and set the hook like you're flipping a switch.